Despite of blood components are constant in all humans , but they differ in blood groups, Scientists classify blood groups into four groups which are: A, B, AB and O, The 14th day of June is the universal day of blood donation, This day agrees with birthday of Austrian scientist Karl Landsteiner , the discoverer of blood groups . Inheritance of blood groups is controlled by three types of genes called alternatives ( allels ) , from which the individual inherits one pair only that carried on that carried on the 9th chromosomes pair in all humans, these genes are symbolized by letters A, B and O. These are only four phenotypes for the six genotypes , which are A , B , AB and O because the allel O is recessive in respect for both allels A and B . The dominance is lacked among the two allels A and B in the genotype AB , Genotypes can be determined by following up the phenotypes of parents and offspring . Multiple allels : There are three allelomorphic genes A, B and O ( the individual has only one pair of them ) . Complete dominance : Both genes A and B dominate over the gene O. Lack of dominance : The genes A and B do not dominate over each other, but they participate in the production of a new blood group , which is AB. Example : A man with blood group ( A B ) was married a woman has blood group ( O ) , The expected blood groups of children are ( A ) and ( B ) . The first family : Blood groups of parents are A and AB , and the blood group of baby is O , The second family : Blood groups of parents are B and O , and the blood group of baby is B . The first family can not give birth a baby has O blood group , The second family can give birth a baby of blood group B or O , By Knowing that each family gave birth one baby only , the baby with blood group O is the son of the second family and the baby of B blood group is the son of the first family . Antigens are found on the surface of red blood cells , they are two types which are Antigens A and Antigens B .
Antibodies are antithetic to antigens and found in blood plasma , They are two types which are Anti-a and Anti-b . Blood can be transfused among different groups according to a special system due to the presence of antigens and antibodies . 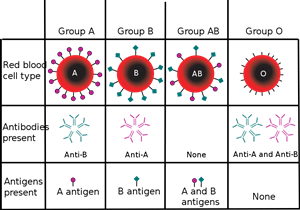 Each group of blood has certain antigens and their corresponding antibodies that agglutinate with them, For example, Antigens (A) are agglutinated with antibodies ( anti-a). 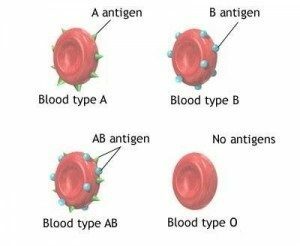 The type of a blood group can be determined through the reactions occur between antigens and antibodies and the occurrence of agglutination of blood , Therefore , for determining a blood group both types of antibodies ( anti-a ) and ( anti-b ) are needed . Two drops of blood of the person to be determining his blood group are placed separately at the ends of a glass slide , We put anti-a on the first blood drop and anti-b on the second blood drop and we separately mix each of them throughly , we observe that the blood may be agglutinated ( + ) or does not agglutinate ( – ) . Blood group ( O ) is called universal donor because it donates blood to all blood groups as it contains no antigens A and B . Blood group ( AB ) is called universal receiver because it receives blood from all blood groups as it is devoid of both types of antibodies ( anti-a ) and ( anti-b).